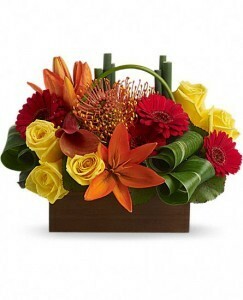 Flowers Including Yellow Roses, Orange Asiatic Lilies, Miniature Red Gerberas, Orange Pin Cushion Protea Plus A Dark Orange Miniature Calla Lily Are Mixed With Bamboolike Equisetum, Galax Leaves And Rolled Ti Leaves, Delivered In A Brown Bamboo Container, Approximately W X H, This Item Is Handarranged And Delivered By A Royal Bloom Florist, All Prices In Us Dollars. Circus Roses, White Lilies, Hot Pink Carnations, Altromerias, Yellow Fuji Mums , Campanulas, Yellow Solidago, With Leather Leaves In A Wicker Basket. 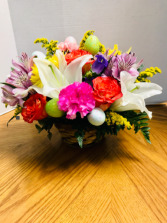 A bountiful basket of colorful Spring blossoms with bright colorfed faux Easter eggs added. Delightful as an Easter centerpiece. 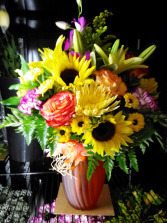 A mixed arrangement, with an abundance of beautiful, fresh blooms, including sunflowers, lilies and roses.